It would be a safe bet to say that each of us at one time or another has woken up, looked at aspects of our lives (work or personal), and found that change is necessary. Building on this oft-repeated thought comes Miki Agrawal with a deceptively easy read that presents real challenges to the reader in order to bring about that change. At first glance, this book seems to be the antithesis of your business read- there’s nothing stuffy or charty about it. In fact, it might one of those books that ‘treps overlook in search of more instructive-looking reads, but that would be a big mistake as Agrawal is an award-winning entrepreneur herself who has firsthand experience. Some of her challenges include basic things like asking for what you want, and others are actually quite difficult to follow through on since most people don’t like to leave their comfort zones. 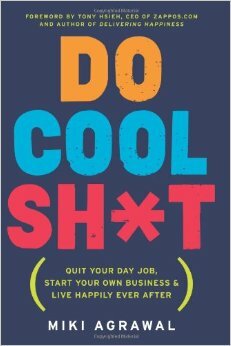 Do Cool Sh*t is great for anyone in a rut or anyone looking to make major changes in their lives. Pick this up if you are serious about evolving for the better.